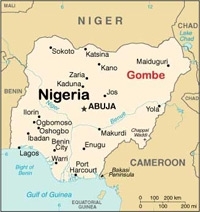 One Free World International has learned that a Christian teacher in a government high school in Gombe, Nigeria was brutally murdered on March 21, 2007 by a mob of Muslim students and local extremists. According to Compass Direct, Christianah Oluwatoyin Oluwasesin had been supervising an exam on Islamic Religious Knowledge in an all-girls’ class when she was accused of desecrating a Koran. She had collected the students’ belongings to the front of the classroom in accordance with routine procedure to prevent cheating when one of the students began to cry. She claimed that her bag contained a copy of the Koran and that the teacher, being Christian, had desecrated the Koran by touching the bag. The class erupted in anger which very quickly spread throughout the school. Local Muslim extremists also arrived on the scene and joined the uproar. School authorities intervened and tried to protect the teacher but could not remove her from school property so they hid her in the principal’s office. They were unable to calm the students down and the mob eventually broke into the office. They dragged the teacher out of the office and beat her to death before burning her body. Afterwards they set her car on fire, engulfing one of the school buildings in flames. A few police officers and firemen called to the scene were pushed back by the mob and were not able to prevent the murder or fire damage. At least 12 students have been arrested and a committee has been set up to investigate the incident. Nigeria is located in western Africa and its population consists mostly of Muslims in the north and Christians and animists in the south, with Christians accounting for close to 50% and Muslims 40% of the total population. Christians in northern Nigeria are facing serious challenges since twelve of the northern states enacted Islamic shariah law beginning in 1999 and the situation appears to be getting worse. Two days after Mrs. Oluwasesin was killed, Muslim extremists in the same town set a church on fire destroying the sanctuary and forcing the congregants to meet out in the open. According to reports, fifteen other churches in the state are also targeted for attack. Christians have difficulty purchasing property and obtaining permits to build churches while mosques are common. Muslim converts to Christianity in the area must flee for their lives to safer towns. In the town of Sokoto in the northwest, Christians fear for the safety of their children in the face of reports of kidnappings and forcible conversions of children. In an alert dated July 18, 2006 about a Christian woman who was stoned to death for evangelizing in Niger state, One Free World International indicated that the Nigerian government has been criticized for not doing enough to ensure respect for human rights in the country. The arrests and investigation in Mrs. Oluwasesin’s murder are an important first step. However, the state and federal governments must follow through and work together to ensure that justice is served and that respect for human rights becomes a reality for all Nigerians. Canada and the United States must use our diplomatic, aid, and trade relations with Nigeria to ensure that the Nigerian government does not avoid its responsibility in this area. • pray for the Muslim extremists in Nigeria that they would experience and be touched by the love of Christ and put away violence and persecution and that the people of Nigeria would be able to live in mutual respect and harmony. • to the Minister of Foreign Affairs or Secretary of State encouraging your government to use its relationship with Nigeria to push for equality, religious freedom, and human rights for all Nigerians.